The Hawk first flew in 1974, and entered RAF service two years later both as an advanced flying trainer and a weapons training aircraft. It has an economical Adour engine an un-reheated version of the same turbofan powering the Jaguar. Hawks are used to teach operational tactics such as air-to-air and air-to-ground firing, air combat and low-level operating procedures to pilots destined for the "fast jet" squadrons. As a weapons trainer, the Hawk is armed with an Aden cannon carried beneath the fuselage, and rocket pods or practice bombs can be fitted to under-wing pylons. To fulfil its mobilisation role as a fighter aircraft, the Hawk carries a 30 mm Aden cannon and two Sidewinder air to air missiles, and is designated T1A (89 delivered to the RAF). The Hawk is a strong and rugged aircraft designed to cut training and maintenance costs. The Hawk has been widely exported as a trainer and single-pilot fighter ground attack aircraft – in numerical terms, by far the most successful British export programme since the Hawker Hunter. By late 2012, over 1000 Hawks had been exported or ordered, including 189 for the US Navy under licence arrangements, in addition to the 176 delivered to the RAF. 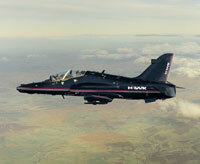 The RAF has two types of the Hawk in service the T1/T1A and the T2. The T1/T1A remains in service with 100 Squadron and the Red Arrows with the current out of service date for the T1/T1A as 2020. Armament (T1A) In addition has inboard pylons for Sidewinder AIM-9 AAM. Note: Reports regarding the operational status of the Aden cannon are contradictory. In July 2003 the Hawk T2 (128) was selected as the new Advanced Jet Trainer (AJT) for the RAF and Royal Navy fast-jet aircrew training. Aircrew trained on the Hawk T2 (128) will move onto operational service with Tornado, Typhoon and Lightning (from 2015). Hawk T2 will be able to provide pilots in training with the all-digital, fly-by-wire experience necessary for pilots flying the latest generation of fast jets. There appear to be 28 Hawk T2 available for service with 24 in the Forward Fleet at RAF Valley. It is believed that 22 aircraft were delivered in 2009 and six in 2010. The in-service date of the aircraft was November 2009 and it is likely to be in service for at least 20 years. Based on past evidence, for every 1,000 applicants to the RAF for pilot training, about 115 complete initial pilot training and of those, about 40 are selected for fast-jet training.